Our Lemon Ginger Shortbread Cookies (made with our Lemon Ginger Shortbread Cookie Mix) are a tasty twist on our iconic Brown Sugar Shortbread Cookies. We again chose brown sugar as the base sugar, then added lemon peel and ginger. As a result, each cookie has the cool and crisp flavor of lemon followed by the subtle after-burn of ginger. 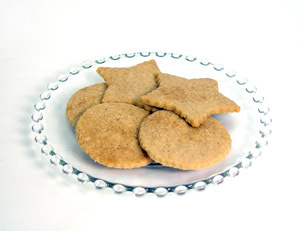 You can bake our lemon ginger shortbread cookies in several ways. For classic wedge-shaped cookies, you can bake a single recipe in a tart pan, and cut them into wedges after baking. You can press the dough into traditional shortbread molds and bake. Or you can roll the dough thin, cut it out with shaped cutters, and bake the cookies as thin wafers. While the lemon ginger shortbread have enough flavor they can be served plain, you can still get creative with finishes. You can brush any of the cookies with a lemon glaze or a lemon ginger glaze if you want to kick up the punch. If you prefer simple, just sprinkle the unbaked dough with cinnamon sugar prior to baking. Of course, we provide directions for both the tart pan and the wafer method of baking. Baked cookies store well in an air-tight container–but beware! They are very addictive and will not last long! Each bag contains 2 complete recipes. Each recipe yields 2 1/2 dozen wafer cookies, or one tart pan (15 wedges). Baking Temperature: When you’re hot. . .or not! Baking Temperature-when hot is TOO hot! Debbie on How to cut in frozen butter–and NOT slice your fingers to shreds in the process! Linda Robson on How to cut in frozen butter–and NOT slice your fingers to shreds in the process! [email protected] on How to cut in frozen butter–and NOT slice your fingers to shreds in the process! © Copyright 2019 Victorian House Scones, LLC. All Rights Reserved.